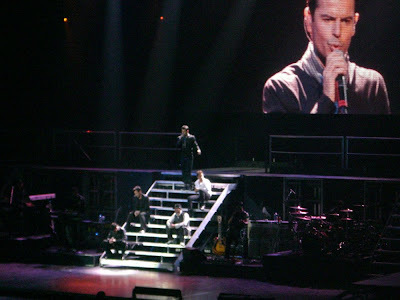 A few nights ago, I went to the New Kids on the Block concert with my sister and sister-in-law ... we had SO much fun! The concert was awesome and I got to stare at Jordan all night. Ahh. They sang a lot of their old songs and it brought back so many memories from back in the day. I was a die hard fan and I had so much memorabilia ... where did it all go, anyway? I even had posters of Jordan plastered all over the underside of my sister's bunk bed so I could stare at him when I was in bed. LOL. So ... where do I get tickets for the next concert? That is so hilarious!! I was totally in love with Joey. I remember in 1990 I went to their summer tour in Atlanta, me and 4 of my friends and our moms rode in a stretch limo, just about as cool as it can get for a 10 year old!! I'm jealous, sounds fun!! OHHHHHH YESSSSSSS!!!! I LOVE!!!! the New Kids on the Block. I know all of their songs. We so would have been BFFs back in the day! 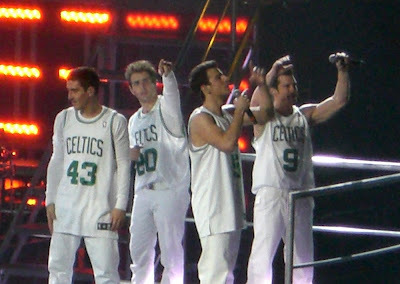 I was a NKOTB FANATIC! I was in LOVE with Joey. I still have my Joey and Donnie dolls...and trading cards and buttons...! Granted, they're in a box in the closet but still! Okay, Kacey totally stole the comment I wanted to make. I thought your blog on this was hilarious, too! Man...we date ourselves, don't we? I remember the New Kids On The Block days! Oh, we are old! Love the photos! I'm sure you drule over them all the time now, huh? Also a huge NKOTB fan & especially Jordan Knight's fan! I had all four walls and ceiling in my bedroom covered in posters, had buttons, dolls, phone, videos and was lucky enough to go to one concert. I hope they come to our area soon!